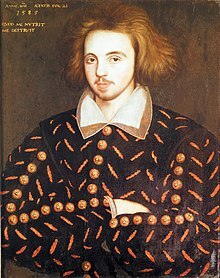 Christopher Marlowe (c. 26 February 1564 – 30 May 1593) was an English dramatist, poet and translator of the Elizabethan era. You sons of care, companions of my course! Pluck up your hearts, since fate still rests our friend. What strange arts necessity finds out. Barabas, Act I, scene i. Paraphrasing John Heywood, "Here lyeth muche rychnesse in lytell space," in The Foure PP (c. 1530). Are hardly cured with exclamations. Barabas, Act II, scene iii. Marlowe is referencing Jesus, "Be ye therefore wise as serpents, and harmless as doves," in Matthew 10:16. Ithamore, Act IV. Quoting John Heywood, "Love me litle, love me long," in Proverbes (c. 1538), Part ii, Chapter ii. Shall with their goat feet dance the antic hay. Pray for me! and what noise soever ye hear, come not unto me, for nothing can rescue me. He that loves pleasure, must for pleasure fall. A brow for love to banquet royally. Which long time lie untouch'd, will harshly jar. All women are ambitious naturally. All they that love not tobacco and boys are fools. Remark attributed to Marlowe from the testimony of Richard Baines, a government informer, in 1593. Lust's Dominion (c. 1600), Act iii. scene 4. The first edition attributed the authorship of this play to Marlowe, though this attribution has been recognized as spurious by critics and scholars for nearly two centuries. See Logan and Smith, Predecessors of Shakespeare, p. 32. But compare: "Comparisons are odious", John Fortescue, De Laudibus Leg. Angliæ, Chapter xix. Lust's Dominion (c. 1600), Act iii. scene 4. Compare: "Thrice is he armed that hath his quarrel just, And he but naked, though locked up in steel, Whose conscience with injustice is corrupted", William Shakespeare, Henry VI, Act iii. scene 2. Peter Bull presents a case for Marlowe as the true author of Shakespeare's Sonnets. This page was last edited on 4 January 2019, at 17:56.